Animated Views’ theatrical reviews are short critiques of films currently playing that you can read before seeing the film. They are as spoiler free as possible. Our friends from Madagascar are back! The first film was madcap and entertaining. The second was a little grim and busy. 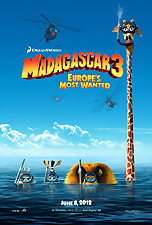 Did the zookeepers at DreamWorks get things back on track for Madagascar 3: Europe’s Most Wanted, believed to be the final chapter in the film series? After a failed escape from Madagascar put Alex, Marty, Gloria, Melman, and their friends on the African continent in the previous film, the gang is ready for another try at getting home to New York. They make it as far as Monaco before running into the world’s most tenacious animal control officer who is determined to see them captured. Luckily they find the only way for wild animals to safely travel across Europe without causing alarm — a circus train. Let’s admit up front I’m a big fan of the Madagascar franchise, because after reading my reviews you would be forgiven for thinking otherwise! The first movie is one of my favorite films from DreamWorks. I was disappointed by the second but it’s still fun to watch and still brings on some laughs. The Penguins of Madagascar TV show is hilarious. So even without review duties I still would have been in a seat on opening weekend for this film. While there were lots of laughs to be had I still feel like they skimped on the story. The trip from the wild savannas of Africa to the wild casinos of Monaco, on the coast of France, is completely skipped — boom! — they’re just there. Our zoo friends, used to sitting around their cages all day, are hiding on a circus train so it’s inevitable that they’ll have to do an act for the show. Boom! — what do you know, all of them just happen to be perfect at some circus stunt without any heretofore knowledge or practice. It would have been fun to actually see them figuring things out — and failing at first — rather than just being good from the start. In the second film’s review I complained that there were “too many story lines competing for a limited amount of film time… [trying] to give every character their own plot” and because “of this, none of the stories get any amount of depth. Every few minutes we cut to a different character to see what they’re up to”. 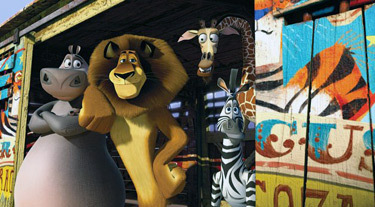 In Madagascar 3 things go wrong in the opposite direction. Alex is our main character and none of the other characters really matter. All of them could have been replaced without much rewriting. Marty, especially, gets the short end and is relegating to one liners after comments from other characters. Animal Control officer Chantel DuBois is a nice addition. Her almost superhero like reflexes and her ability to outwit anyone around her make her a formidable foe — and hysterical to watch! Though sometimes maybe they made her a little bit too Terminator-esque. DuBois is nicely voiced by Frances McDormand. 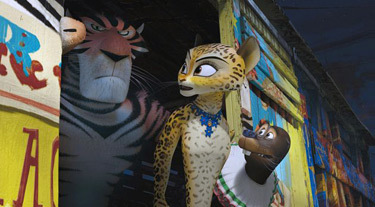 The other new characters in the film are the circus animals they encounter. The designers did much better than in the second film (where I complained that the new character designs were “not nearly as interesting as the ones created for the first film” are were “mainly cookie cutter copies”); here the newcomers are as unique and fun looking as those from the original film. Bryan Cranston as Vitaly, Jessica Chastain as Gia, and Martin Short as Stefano all put in nice performances but don’t really have a lot to work with story wise. As usual, the lemurs, monkeys, and penguins, are real highlights of the film. Every scene they’re in just works. And almost stealing the show is King Julian and his new found love Sonya the Bear. Their tour of Rome while Andrea Bocelli sings is worth the price of admission alone! In the end, Madagascar is all about fun, and there the film delivers — and improves on the bleaker previous outing. You’re definitely not going to have to think too much (if at all!) but you’ll leave the theatre smiling. And after paying today’s ticket prices that is no small achievement!